Writing is the best ever known way to communicate and to share views. There are lots of differences between verbal communication and communicating through writing. In verbal communication, we can make changes, but in writing, we can’t take back what we have said. So improving writing skills are essential and a must for everyone because it can be useful in many occasions. Some people have excellent writing skills and some don’t. Writing skills is needed for all professional students, architects, engineers, doctors and lawyers in submitting project work or paper presentation. The more you write, the more you will improve. Practice writing Daily: Everyday, try to write something on your own, without practice, you can’t get better at writing. Take a paper and write your daily incidents or write something which is interesting to you. Don’t bother about the technical details, just write what come to mind. The more you practice, the better you will become at it. Make it a habit to write daily and you’ll be surprise at the improvement within a month. Practice Reading Daily: Reading books and newspaper daily will definitely help you in improving your writing skills. Go to public library and get some knowledge oriented books and study their writing styles and techniques. You can also get books about writing and it will help you raise your writing level. 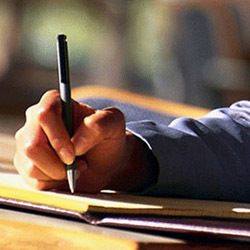 Join writing courses if you are a beginner, it is the best way to improve your writing skills. As there are many on-line courses for free, you can join them with ease. If you are not able to improve your writing skills through on-line courses, you could try classroom courses. In the classroom, you can share your views with classmates and teachers and expand your knowledge about writing. Work in Newsgroups: Take tips and advices from newsgroup members and share their views in writing an article. Ask for guidance! Share your article with them so they can suggest what to do and what not to do. Focus on improving your writing level with their advices as they may be well experienced in crafting an article. Get a Critic to find mistakes: Get some experienced people to find mistakes in your article. By rectifying your mistakes, you can improve your writing skills. Writing a good article is important, so be sure to find someone to edit your article to find mistakes. Make the habit of writing, reading and editing by yourself. Don’t Forget The Style in Writing And Closing The Document: Practice writing skills with style. Don’t use abbreviations, bracelets without proper use. Write the names clearly. Make the sentence in short form. Letters should be pointed to an individual and the document must be simple and clear. After writing the document, check spelling and grammar mistakes by yourself and spell the names and address clearly, check the address which you have mentioned. Be cautious in writing and submitting the article.